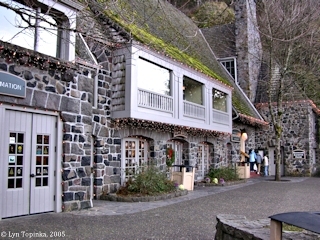 "Multnomah Falls Lodge, Multnomah Falls, Oregon"
The Multnomah Falls Lodge is located at Multnomah Falls, Oregon, at Columbia River Mile (RM) 136. It was built in 1925 as an overnight rest area on the Historic Columbia River Highway. Originally the lodge had dormitories and four rooms for the overnight stays. As early as 1927 the building was enlarged, and again in 1929 the striped awning patio gained permanent walls and became part of the building (see "The Golden Age of Postcards" below). "... Another required stop is always Multnomah Falls, the second highest water fall in the U.S. at 860 feet. In 1922, the land was given to the city of Portland by the Oregon and Washington Railroad & Navigation Company, forerunner of the Union Pacific. 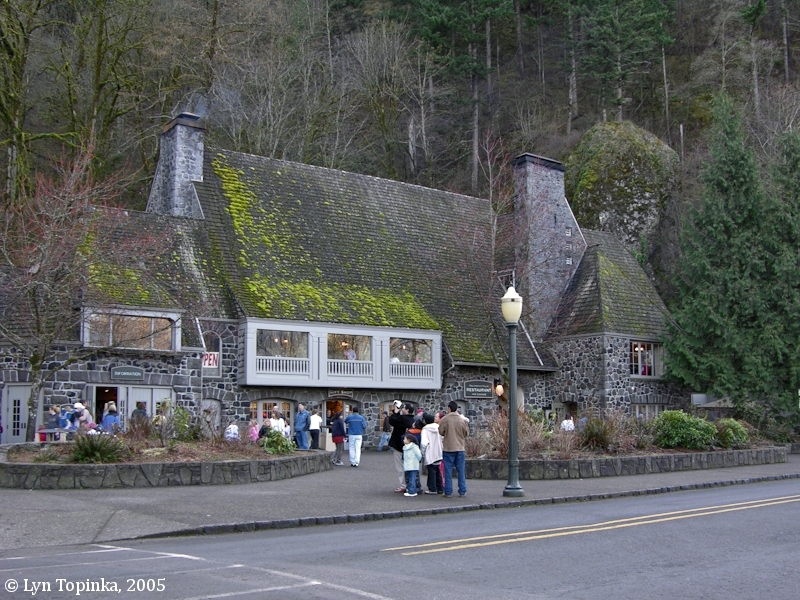 The Union Pacific regularly stopped on Multnomah Falls Lodge when it was a train depot. 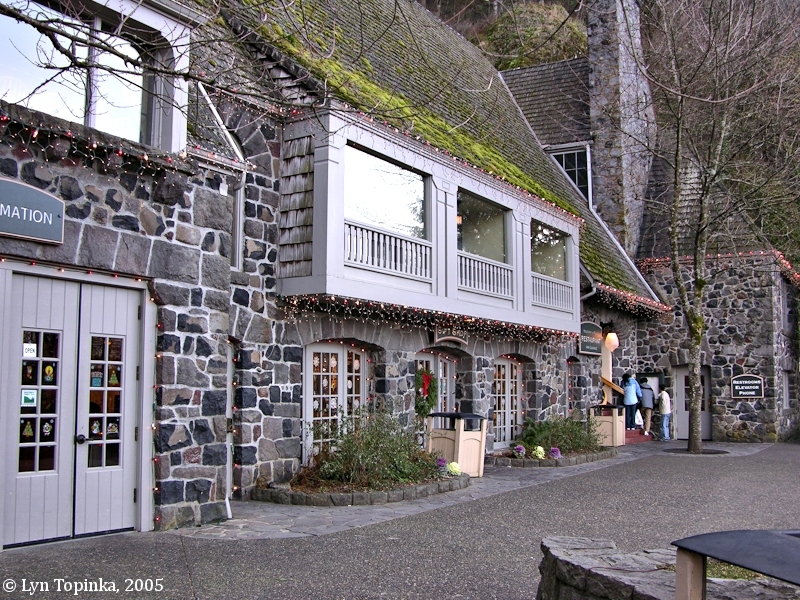 The Cascadian-style Multnomah Falls Lodge was completed in July of 1925 at a cost of $40,000. The Lodge was designed by the famed architect A.E. Doyle, designer of the U.S. Bank Building, Reed College and Lipmans. Rolla Simmons, famous for Simmons Hillvilla, was the first concessionaire. In 1929, the canopy-covered patio was removed and the building was extended further to the east. 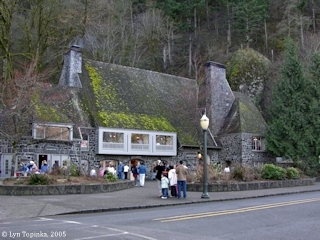 Ownership of Multnomah Falls Lodge was passed to the Forest Service in 1939. 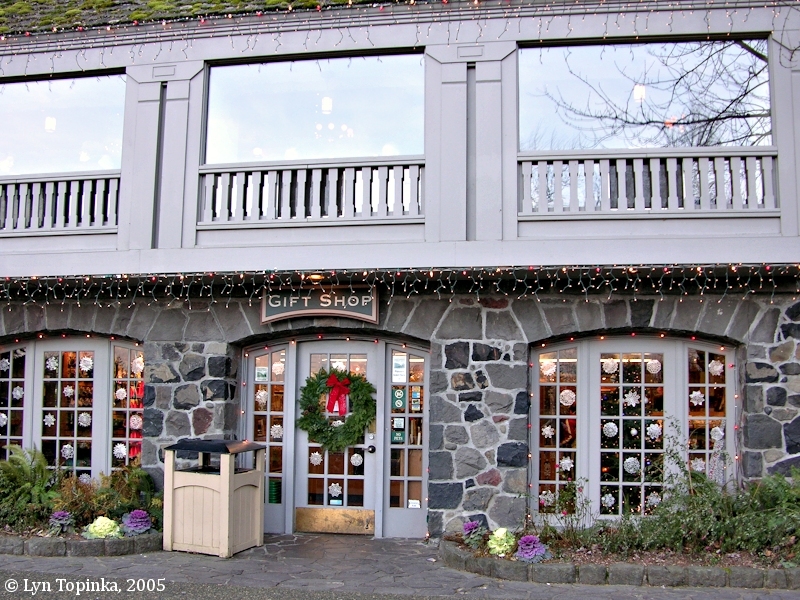 Simmons continued to operate the food services at the Lodge until the Lodge closed in November 1942 during World War II. After the war, the Lodge was remodelled and it reopened in February 1946 under new management. Multnomah Falls remains one of Oregon’s most popular attractions and the Lodge recently celebrated 75 years. 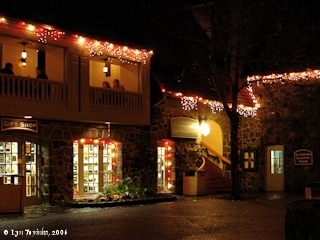 ..."
In 1981 the Multnomah Falls Lodge and Footpath (Benson Bridge) were listed on the National Register of Historic Places (Building #81000512). 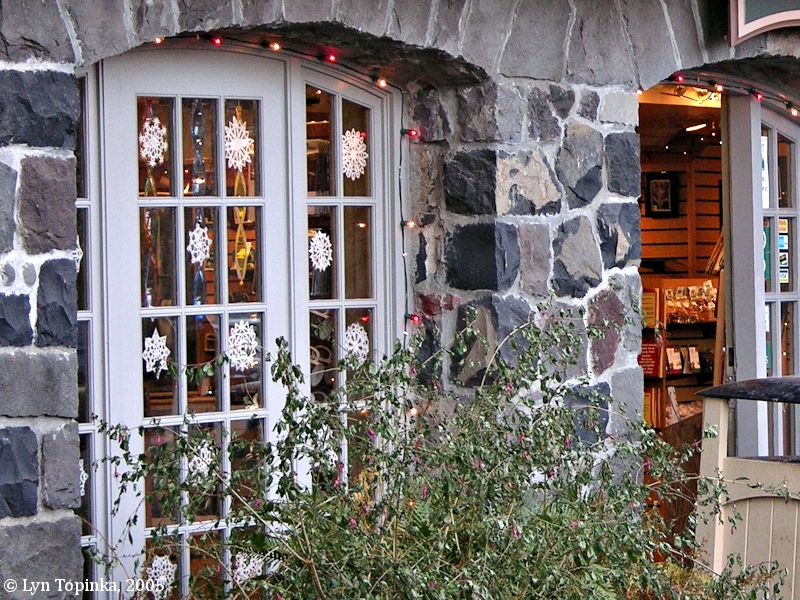 Every type of rock found in the Columbia River Gorge is represented in the Lodge. The first concessionaire at the Multnomah Falls Lodge was Rolla Simmons, owner of Portland's "Simmons Hillvilla", who called his establishment "Simmons-By-The-Falls" (see "The Golden Age of Postcards" below). 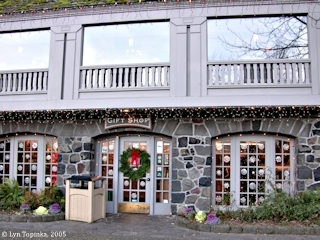 Simmons operated the restaurant until the Lodge closed in November 1942, during World War II. When the Lodge re-opened in 1946 it was under new management. Penny Postcard, ca.1920, "View in front of Multnomah Falls, Columbia River Highway, Oregon.". Building on left was the "Multnomah Hazelwood", an ice-cream stop which was open 365 days of the year. Published by The Oregon News Company, Portland, Oregon. Card #27. In the private collection of Lyn Topinka. 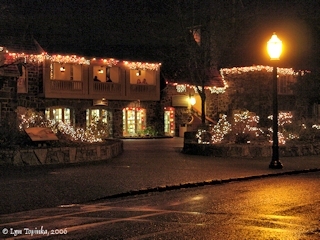 Click image to enlarge Christmas season, Multnomah Falls Lodge, Oregon. Image taken December 10, 2005. 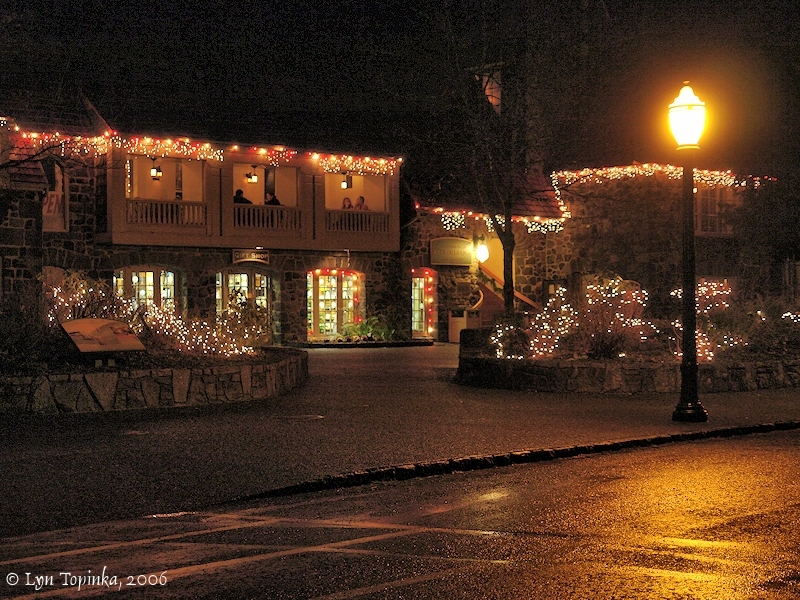 Click image to enlarge Christmas decorations, Multnomah Falls Lodge, Oregon. Image taken December 10, 2005. Penny Postcard: Multnomah Falls, Oregon, ca.1920s. Penny Postcard, ca.1920s, "Multnomah Falls Lodge, Columbia River Highway, Ore." The striped patio canopy was replaced by a new building section in 1929. Published by The Oregon News Co., Portland, Oregon. Card #170.In the private collection of Lyn Topinka. Penny Postcard: Multnomah Falls, Oregon, ca.1930s. Penny Postcard, ca.1930s, "Multnomah Lodge, Multnomah Falls, Columbia River Highway, Oregon.". Caption on back reads: "Multnomah Falls on the Columbia River Highway, 23 miles east of Portland, Oregon: Where a cataract leaps down shear 620 feet in a roaring, mystic white.". Published by the Wesley Andrews Company, Portland, Oregon. Card #832. In the private collection of Lyn Topinka. Caption on back reads: "Multnomah Falls on the Columbia River Highway, 23 miles east of Portland, Oregon: Where a cataract leaps down shear 620 feet in a roaring, mystic white. ".